"This is our ancestor's land! It's time to get our garden back." 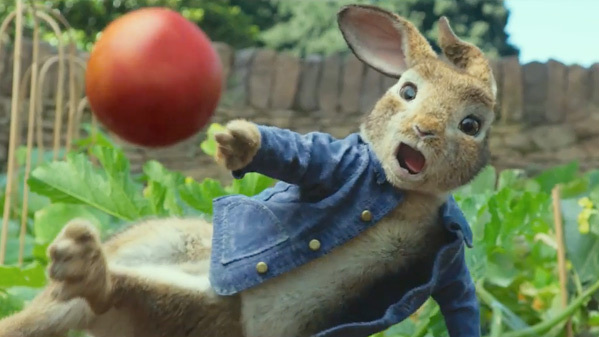 Sony Pictures has debuted a new, full-length UK trailer for Will Gluck's Peter Rabbit movie, a hybrid CGI family comedy about the lovable rabbit rascal who messes with Mr. McGregor. Peter Rabbit is voiced by James Corden, and the triplets Flopsy, Mopsy, and Cottontail, are voiced by Margot Robbie, Elizabeth Debicki, and Daisy Ridley. The human cast includes Domhnall Gleeson as Mr. McGregor, plus Rose Byrne. The footage in this trailer is so goofy, and not in any entertaining way, just an endless amount of wacky things happening involving animals that can talk. It's so quintessentially British, too. From what I hear, Paddington 2 is much better than this will ever be and is worth your time. I can barely even get through this trailer without cringing. Try to have fun. You can still watch the first teaser trailer for Peter Rabbit here, if you want even more footage.